For this card, I stamped the flowers on bookpaper and then cut out. I added some extra color with markers. 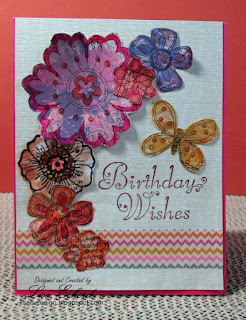 The flower stamps are a mix of different ones, mostly Stampin' Up! I originally started making these flowers for a mixed media canvas. You could use them on all kinds of papercrafting projects.